Temple Of Iris is a 5 reel, 25 payline slot game with a 95.4% RTP. This UK Online Slot comes with Free Spins, Scatter Symbol, Gamble and Wild feature. Uncover the hidden secrets of Egypt with Eyecon’s first ever online slot game! The 5 x 3 reels give you an RTP of 95.4% and 25 different ways to win! The Egypt theme is running strong in this adventure packed slot which offers you a massive 1350x multiplier for the max jackpot along with Eyecon’s 50 / 50 bet feature & free spins! Temple of Iris was the first ever game released by Eyecon, the successful game developer used it to kick off their successful portfolio which is now well over 60 games strong. If you’re not all too up on your Egyptian history, don’t worry, we’ll run you through all of the interesting bits so you really can make the most of the authentic feel of this online slot. History has moved on pretty far since the days of the Egyptians, but that doesn’t make it any easier to stop finding them fascinating. Our modern fascination with the Egyptians is largely down to Howard Carter; a British archaeologist who was fascinated with Egyptology. After the discovery of the tomb of Tutankhamen in 1920, he became one of the most famous archaeologists to have ever walked the planet – no, Indiana Jones doesn’t count! Sadly, he didn’t live for much longer after his discovery as he died in 1939, but what he found would change the face of history forever. Anyway, after Howard Carter’s discovery the world got to learn a little more about the myths and legends of this fascinating era which was so far ahead of their time. That’s why some people tend to assume that the pyramids were built by aliens!! But plenty more elements of their culture were ahead of their time. Egyptian culture was defined by their worship of Pharaohs, however their belief systems tended to shift depending on who was in power. Queen Nefertiti was keen to promote the god Aten who she believed should have been the only God to be worshiped. While the Catholic religion is defined by crosses and rosemary beads, Egyptians used animals to worship their Gods and would practice odd rituals such as bathing in milk. In short, there is plenty to explore with the Egyptian culture, so it’s really no surprise that Eyecon chose to explore the ancient lands of Egypt with their online slot. It sets the imagination alight as you spin the reels wondering which part of the Egyptian history you will unlock next. Temple of Iris was released back in 2003, making the online slot over a decade old, yet, it is never far from the list of most popular played slots. Despite how old the online slot is, the graphics and the gameplay can’t be faulted. It really is no wonder that Eyecon came to be the most successful game developers in the world after the release of Temple of Iris. 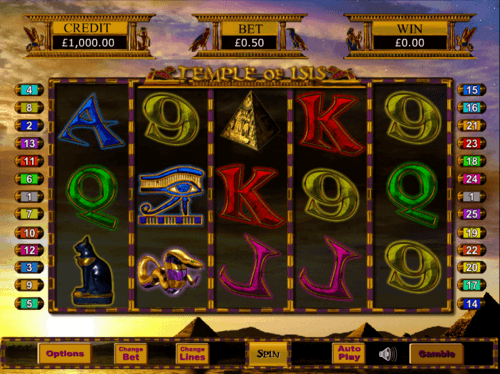 The online slot has had a little bit of a rebrand since it’s original release, the original title of the slot was “Temple of Isis” which was renamed for quite obvious reasons! Now, Fluffy Favourites may be the online slot that Eyecon is renown for, but Temple of Iris definitely paved the way for their success. The game stood as a testament of their creative talent and design skills. You’ll have to forgive the graphic quality slightly, however at Money Reels, we’d have to say that the online slot has aged well, anyway, Eyecon never tend to go all out when it comes to graphics, they seem to use their own unique and charming visual style to get reel spinners hooked on their games. The seminal work from Eyecon didn’t go all out with overcomplicating the gameplay to the online slot, that would have been a questionable move as the world was only just getting used to online slots back in 2003. When you load up the reels you will see a graphicly stunning sky, hues of pink, blue and yellow are bright in the sky as the sun is setting over the three Pyramids at the bottom of the screen. They have even paid extra attention to each aspect of the screen as the bet amount, your coin balance, and the amount you have won will be protected by icons of Egyptian culture and the frame of the reels is a stunning gold and purple striped sleek design. The Egyptian theme will be further extended by the symbols on the reels, however Eyecon also chose to include some alphabetical and numerical symbols. The lowest valued symbols are the following 9, 10, J, K, A. While the highest value symbols will be the Egyptian symbols. The Egyptian Princess is the highest valued symbol on Temple of Iris, she also acts as the Wild card of this online slot. Matching 5 priestess symbols can win you 9500 coins. The second highest symbol is the scarab beetle which can win you 950 coins if you match 5 – the same amount which can be won if you match 5 of the Eye of Horus symbols. To win 450 coins you’ll need to match 5 of the snake symbols who represented the god Aten. While the Ankh Cross will win you 250 coins if you manage to match 5. Back to the Priestess, she’s probably the reason why Temple of Iris reached the heights of popularity which it did. As well as being able to win you 9500 coins, she is also able to help you form more winning combinations by replacing other symbols on the reels. But that’s not all, every winning line that she’s a part of will be doubled – she seems to be an incredibly generous Priestess, but we probably still wouldn’t want to get on the wrong side of her! The scatter card in Temple of Iris also helps to improve the excitement in the gameplay, by giving you the ability to be entered into the bonus round, as well as being a high valued symbol too. If you match 5 pyramid symbols, you will win 450 coins. However, if you find more than three of them, you will be automatically entered into the bonus feature of this online slot which we will now explain in more detail. Back when Temple of Iris was released, the bonus features of the online slot seemed fairly generous, however now, they appear to be a little on the light side. However, if you are looking for simplicity with a bit of an adventure theme, you certainly won’t be disappointed. Technically, there are two bonus features to play with on Temple of Iris – but one of them is totally optional whether you want to play with or not. If you have already spun the reels on Eyecon slots before, you will notice that they tend to run with the same bonus feature. So, you could say that their free spins bonus feature is a solid classic. Even their contemporary games released in 2018 and 2019 only run with this feature, so, it’s important not to allow the bonus features to give the game a dated feel. The amount of free spins which you will win depends on how many of the pyramid scatter symbols on the reels. However, this isn’t all that Eyecon have offered from this free spins bonus round. You will be able to grab even more free spin by retriggering the feature when you find more of the pyramid symbols on the reels while you are playing in free spins mode! In addition to this, each winning combination in the free spins round is worth even more than what you would win in the main mode of play. Each win will be trebled! The 50 / 50 Bonus feature is there if you want to play with it, however it certainly isn’t necessary. This is yet another one of Eyecon’s staple features which gives you the chance to double your money. On the flip side, if you lose, you’ll see your winning amount disappear forever! You’ll see the option to use it pop up after every winning combination, if you choose to play with it, you will be presented with two different options, chose correctly and you will get your wins doubled! After the release of Temple of Iris, Eyecon became a name synonymous with quality gaming experiences. However, when they first started out, they didn’t create an online slot game. Instead, they tested the water with a more traditional Sci-Fi video game which was hugely popular. Their first game was released in 2002 and was titled ‘Gore’. However, they seem to have taken a very different approach to their online slots. While there are horror-themed slots available to play online today, Eyecon still hasn’t been compelled to make one. Instead, they tend to explore cute and cuddly, fantasy or adventure themes. Temple of Iris may have been the first online slot from Eyecon, but three years later when Fluffy Favourites came along, the online slot absolutely stole the show allowing Eyecon to establish themselves as one of the best game designers in the world. As they are located in both Australia and the Channel Islands, they didn’t struggle to become a global brand – as they technically were anyway. In 2019, they have just over 60 games in their portfolio. However, in 2018, the reels of those online slot games were spun over 6 billion times. That should give you a pretty good idea on just how popular Eyecon’s games are, not only in the UK, but also in many different corners of the globe, who knows, they are probably even popular in Egypt! Speaking of Egypt, here’s what Eyecon had to say about Temple of Iris when it was first released. If you’re not still convinced about playing Temple of Iris, you can also try the online slot out for yourselves by heading over to Eyecon’s website! Even if you are compelled to play the most modern games, you will still find a lot of appeal with Temple of Iris, in fact, some might even say that every Eyecon slot has been modelled off the success of Temple of Iris, so find out what the original is all about. Considering that it is only just off the top 100 list speaks volumes for how great this online slot is! It is over 16 years old! As with most online slot game themes, they have been explored more than once. While Temple of Iris was probably the fist Egyptian-themed online slot game to ever exist, Eyecon were still keen to delve even deeper into the culture of Egypt with their releases. We’ve listed three of the top alternatives if you don’t want to move far away from the pyramids when spinning the reels. Creating Jackpot versions of online slot is a fairly typical move from Eyecon. So, it really should come as no surprise that Eyecon wanted to celebrate their success with their seminal work with a Jackpot version. If you’ve already played a Jackpot game before, you will know that not all too much changes from the standard gameplay aside from how much you can win with the jackpot, and the change in return to player rate. Of course, that’s normally all players are looking for when they are playing a Jackpot version! However, with Temple of Iris Jackpot, you’ll have to say goodbye to the generous priestess and say hello to a Blue god – maybe she has been dethroned! But he doesn’t seem to be all too much of a merciless ruler as he allows you the chance to win a progressive jackpot! Progressive jackpots aren’t fixed amounts. The Temple of Iris is even more appealing due to the fact that there is absolutely no limit to how much you can win! As the jackpot can be staggeringly high (think in the sum of 6 and 7 figure amounts!) you will see a drop in the RTP from just over 94% to 89.9%. So this means you will receive less frequent wins however the wins you can earn are much higher. Caravan to Cairo slot is a bit of a Fluffy Favourite and Temple of Iris mash-up, the authentic Egyptian feel is accentuated by the cute factor of the iconic series. So, if Temple of Iris wasn’t cute enough for you, Caravan to Cairo is definitely the slot game you’ll want to spin the reels on. The scene will be set through the use of stunning Egyptian imagery which is accompanied by some Egyptian music. Maybe it isn’t all too dissimilar from what King Tut used to listen to back in the day, but I’m not entirely sure how that can ever be proven – the idea is nice to run with regardless. Each of the symbols which you will appear on the reels each has a cute and cuddly twist. However despite the adorability factor, Eyecon were pretty serious about the gameplay. Generally, Eyecon only tend to offer 25 different ways to win, so Caravan to Cairo is definitely different as it offers 243 different bet lines to play with. The choice may be overwhelming to some online slot fans, but for others it’s exactly what they are looking for. RTP wise, you’ll see a 95.2% return which makes this slot highly volatile. If you love cuddly animals and Egyptian mythology, don’t hang around on trying this online slot out for yourselves! Were Pharaohs lucky? That’s hard to say, but plenty of reel spinners have experienced plenty luck when they have spun the reels on this incredibly exciting online slot. Pharaoh's Luck was the third time Eyecon had explored the Ancient Egypt theme, and some may say it was third time lucky, however it isn’t for everyone. There’s a more serious feel to Pharaoh’s Luck so it definitely isn’t everyone, but the reels are stunning thanks to the imaginative and authentic symbols which are on the reels. There’s also a prize pick bonus feature in addition to the free spins round. This exciting feature also accompanies the usual 50 / 50 gamble bonus which Eyecon always love to include with their online slots. Still looking for more options? We’ve got you covered with three of the best alternatives from Eyecon’s best competition. Money Reels are also happy to provide these online slots to our players. We’re sure Eyecon doesn’t mind a little bit of healthy competition, after all, variety is the spice of life! Pragmatic Play provide Eyecon with the strongest competition, and Ancient Egypt definitely stands as one of the best Egyptian themed online slots you can play today. For people who enjoy HD stunning graphics, you won’t be disappointed by the HD intensity you will experience with Ancient Egypt slot, but it’s more than just a pretty face! The high volatility of the 5 x 3 reel slot is also a massive bonus. Although there are only 10 different pay lines to play with! However for those who only like to play with a low number anyway, this really isn’t an issue – the RTP is high enough anyway! You may not have heard of the game developers before, but that didn’t mean that they didn’t create a spectacular slot with Scrolls of Ra. Graphics-wise, it is probably the closest you will get to Temple of Iris outside of Eyecon’s portfolio. However, some may say that they are slightly more appealing. That’s up to you to decide, but the return to player rate sitting at a generous amount of 95.71% and the online slot offering plenty of bonus rounds there’s plenty to play for in Scrolls of Ra. Even though it won’t be long until Temple of Iris is nearly 20 years old, it’s still brilliant to play on mobile! Even though this was well before the time of mobile gaming, Eyecon made sure they put in the adequate amount of time into developing the mobile edition. There are absolutely no complaints from our players when they are logging into the reels on our site from their mobile or other handheld devices.